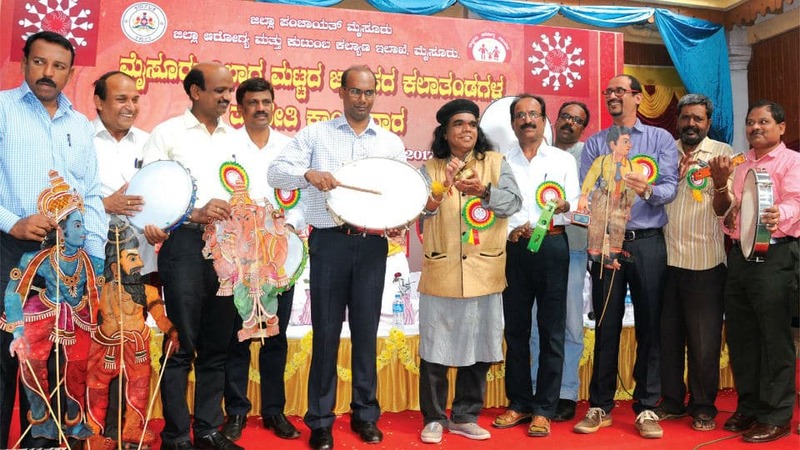 Mysuru: A three-day training workshop for folk troupes of Mysuru division, organised jointly by the District Department of Health and Family Welfare and Department of Kannada and Culture, commenced yesterday at Nanjaraja Bahadur Choultry in city. The folk troupes would be groomed by the Health Department officials on various health issues. The folk artistes would later create health awareness among rural people through folk songs and plays. Inaugurating the workshop by beating a drum, Deputy Commissioner D. Randeep opined that seminars and lectures on health awareness were not enough and effective, for rural folk in particular. Hence, he contended that the folk artistes would convey the message better through folk songs and plays which would drive the message together with some entertainment. He assured to collect a feedback from the people. He further said that the workshop was envisaged under National Health Mission with a theme ‘Information, education and communication.’ Randeep added that the Mission would also try to eradicate certain superstitious beliefs existing among rural people regarding health problems. About 200 folk artistes from eight district are participating in the workshop. District Health Officer Dr. B. Basavaraj, Theatre Artiste Mime Ramesh, State Health Education Officer Rajahanumaiah, Assistant Director of Department of Kannada and Culture H. Channappa, District Vector-borne Diseases Control Officer Dr. Chidanand and other were present.